Krishna Kantha, Thailand’s living saint, gently placed his hands on top of my head. I could feel an icy coldness penetrating my skull. A lovely golden ball of liquid energy soon formed in the center of my brain. “Go meditate. No talking, cell phones or TV. Be quiet. Walk in the grass. Observe Nature,” came instructions from best meditation teacher I ever had. My head felt like it had been stuffed with cotton wool for the next few days. Any attempt to talk or do any intellectual activity brought a headache. My mind could see inside the golden ball in my brain. Millions of sparks flew about in it. These sparks were busy rebuilding my brain cells. All my old patterns of intellectual thinking were disappearing. Awareness was growing along with the golden ball. The ball of sparks became bigger and bigger until it encompassed my entire brain before proceeding down my spinal cord to work on it too. After three days, I could walk about performing the daily chores of life while holding the empty mind state. No thoughts at all arose while doing physical activities. Buddhist monks practice Vipassana meditation all day every day for many years to achieve this. I had it in just three days! After three weeks, I had also experienced oneness and emptiness, two of the most advanced states of meditation. In the years since my experiences on retreat at Krishna’s, I had often wondered if my visions of the golden sparks rebuilding my brain were imagination or reality. Then I read a study by the University of Massachusetts Center for Mindfulness. 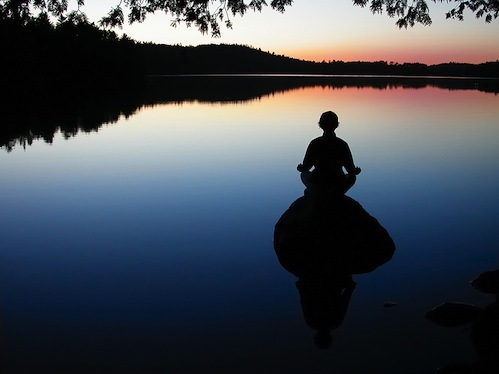 The study shows that meditation actually grows grey matter in the hippocampus. This area of the brain is already known as being associated with learning and memory, and with structures related to compassion, self-awareness and introspection. Compassion, self-awareness, and introspection. Those are exactly the areas that we target in meditation. For thousands of years, metta meditation has focused on growing loving compassion for all living beings. Does growth in compassion come as a direct result of growing more brain cells in the brain’s structures associated with compassion? After reading this report, it seems highly likely. What’s even more interesting is the fact that meditating caused those brain cells to grow. Wait a minute. I thought that new nerve cells didn’t grow in adults. Can the brain actually grow new cells? This study by a highly respected American medical institution definitely shows increases in grey matter after only eight weeks of meditation. Further contemplation led to me remembering another experience regarding my brain function. In the years after I left Krishna’s center, I kept seeking out Masters all over Asia to receive more brain changing energy from. Krishna had told me that receiving from different people was necessary to ensure as broad an experience as possible. After about two years, another interesting change occurred. It felt like the two halves of my brain actually grew together. Investigating this phenomenon led me to the writings of Sri Aurobindo, one of India’s great philosopher/saints who died in 1950. He writes that at a certain stage in meditation, the awareness and intellectual functions of the human brain combine into one. It’s no longer necessary to switch back and forth from being either in awareness or in the intellect. The brain goes into an entirely new state that Sri Aurobindo termed Super Consciousness. In Super Consciousness, you’re completely aware in the present moment and able to engage in cognitive functions at the same time. It’s like having an empty brain in overdrive while being totally calm and relaxed with exactly the right thoughts popping up out of that emptiness. Liner thinking becomes obsolete. There’s no distracting mind chatter. This is what I was experiencing. I was able to have a conversation about it with a Dasa at AmmaBhagavan’s Oneness University in India. “It felt like the two halves of my brain grew together. Like I don’t have two halves anymore. I’ve just got a whole brain. Did this really happen? I asked him. “That’s what happens,” he said. Meditation opens up an entire new vista of mental abilities directly associated with changes and new physical growth in our brains. Western medical science is only now validating what Eastern meditation practitioners have known for millennia. Meditation makes you smarter in ways that you can’t begin to imagine in your present state. Richard Crown blogs and teaches meditation and healing at Shaktipat-meditation.org.